Sacha Baron Cohen has always given his audience an entertaining yet enjoyably raunchy mix of comedy with a great comedic performance to boot, but as Admiral General Aladeen, Cohen fails to convey his usual genius. Borat drew the line for an over the top offensive comedy but played right beneath the bar, keeping it clean enough to laugh at its humor guiltlessly. However, this is not the case for The Dictator. 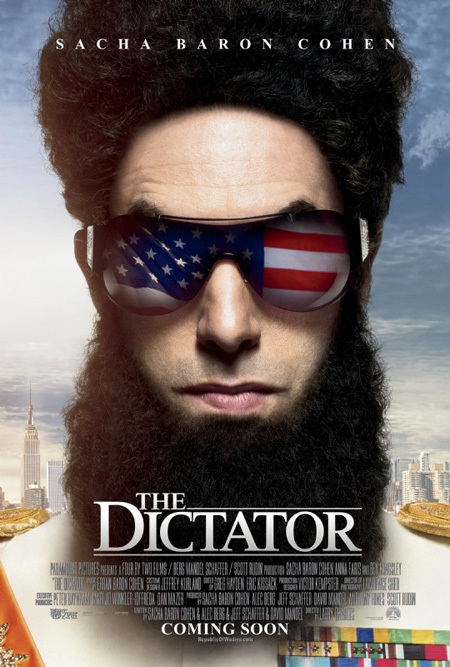 The film begins with an overview of Aladeen (Cohen), dictator of the fictional country of Wadiya. The timeline of Aladeen’s life jumps from his birth (with humor too quickly established) to the achievements he has made as dictator such as his own Olympic games and changing every other word to “aladeen” (which is a joke that gets old after the first try yet persists through the whole movie). Aladeen is forced to embark upon a journey to the USA after the United Nations forces him to choose between war or submission. Once Aladeen arrives, he is abruptly abducted and is forced to live in New York without his recognizable beard, making life hard for the fallen dictator. The cast is lead by Cohen with Anna Faris, Ben Kingsley, John C. Reilly and a few entertaining cameos. The acting on the whole, though, is dull; Cohen usually packs a punch and delivers his performance with genius timing and a more believable accent. As Aladeen, he fails to bring the bravado seen in Borat and Bruno. His accent is too choppy and his slapstick is lame. It pains me to watch such a great performer as Ben Kingsley try to bring up a comedic role as Aladeen’s jealous second in command. His performance is rough and painful and he doesn’t even try to act. It’s almost as if he agreed to do the film for the sake of fun, but soon realized what a waste of energy it was so he gave minimal effort. John C. Reilly, another fantastic performer and great comedic actor, is also miscast as a nameless security agent with nothing to do. He tries to be quirky and racist but seems uncomfortable in such a role. Granted, I can only speculate on his performance since he was simply wasted and used for almost five minutes of screen time. Faris seems to be the only one in the cast willing to try in this film. Though it is not a stellar performance, she provides some necessary sanity as Zoey, a local supermarket manager. First off, I just want to point out that most of the jokes from the trailer appear in the first 20 minutes of the film. The same can be said for the plot: it is condensed and rushed so that most of the major events occur within the same time slot. With so little time for a storyline and so much time to fill for a movie, it seems to drag on endlessly. The plot fails to follow the consistent wackiness and unexpectedness that Borat delivered and is slow and, more importantly, unoriginal. Almost nothing happens throughout the entire film besides his sudden infatuation with Zoey. The humor in this film is the main issue. Like most of Cohen’s work, the comedy is harsh and offensive. However, Borat knew where the line was and was sure to play right on the line without crossing it. With Bruno, Cohen crossed the line but returned to normality at intervals. The Dictator, however, jumps straight over the line and is simply an hour and a half of racist jokes insulting all walks of life. Not only that, but the jokes are banal and consistent though this form of comedy is usually executed better in other mediums. Personally, I’ve seen these types of jokes more cleverly and successfully written, in episodes of Family Guy. Though this film is not as dirty as his previous ones, there is a birthing scene assured to leave you shaking your head in shame out of sheer stupidity and raunchiness. The majority of the comedic effort is not all bad, (the helicopter scene was well performed and the speech at the end seems obviously sarcastic in a humorous way) yet it does seem to drag on throughout the movie overall. It seems almost a sin to compare this film to Charlie Chaplin’s The Great Dictator, but it’s hard to overlook this. Both are released in a time where the subject matter is real and horrifying yet the comedians involved try to lessen the tension of the issue with humor. Nonetheless, there is one significant difference: a message. The Great Dictator uses slapstick comedy (comedy appropriate and loved at the time) to sugarcoat the true horrors in society and make the audience forget the world’s troubles for only a couple of hours. The Dictator uses gross and inappropriate humor (which is apparently the comedy America respects now) to insult both the dictators posing a threat to this country and the country itself. Chaplin delivered a heartfelt performance with a powerful, personal, and emotional speech highlighting a wrap up to the plot whereas Cohen continues to mock America with his fake inspirational speech at the end. Cohen is nothing but insulting to everyone in the world finding it difficult to understand who this film is supposed to be aimed at. On the whole, The Dictator is rude, offensive, and aims to mock every race or religion in the world, which fails to make it a likeable movie. The humor is bland and has already been done better in other mediums while the acting is upsetting and uninteresting. The plot is rushed, leaving little to no room for interesting twists or subplots. But what The Dictator needs most is some heart, some form of relief in this time of terror and fear. Without a true message to back the story, the film will fall short of all expectations and leave the audience with a want for something more.